With over 1700 pages of information, this manual will help you repair and maintain your Dodge with ease. Very easy step by step instructions with lots of diagrams. 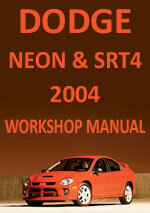 Dodge Neon & SRT4 2004 Workshop Service Repair Manual $7.99 Immediate Download!